Château de Chenonceau is a historic castle in Loir, France. Visitors may tour the castle’s historic bedrooms, lounges, art collection, and gardens. Each day guests are greeted by floral arrangements from the castle’s on-site floral workshop. The castle itself is a masterpiece of Renaissance architecture, and sites astride the Cher River in the Loire Valley. 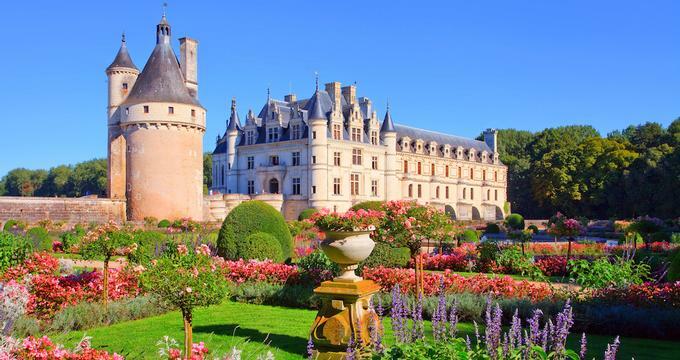 The castle is a mix of early Renaissance and Gothic architecture, and is among the most famous of the Loire castles. Guests may tour the original medieval Marques Tower, the main building of the castle and its rooms, and the castle’s long gallery, which spans the river over five arches. Highlights of the tour include the guard’s room, with its 16th century fireplace, decorated by 16th century tapestry, and showing exposed ceiling joists bearing the mark of “C” for Catherine de Medici. Diana de Poitier’s bedroom includes a 19th century bronze statue, two 16th century tapestries, and items from the castle’s archives, which are signed by both Thomas Bohier and Diana van Poitiers. The Green Study is the room from which Catherine de Medici governed France after the death of her husband, King Henry II. The room displays an extraordinary collection of paintings including works by Van Dyck, Tintoretto and Poussin. A Louis XIV drawing room contains a portrait of the young king, in memory of his visit there in the 1600’s. Catherine de Medici’s bedroom displays a painted and gilded square coffered ceiling and a Renaissance style four-poster bed. The castle’s Medici Gallery displays additional items from the archives, artwork, furniture and historical artifacts. The gardens surrounding the Chateau include Diane’s Garden, unchanged since its original layout with the original water feature. Catherine’s Garden consists of five lawns surrounding a pond and an original garden maze. Also on site is a carriage gallery with a collection of French and English horse-drawn vehicles, and a 16th century farm and vegetable garden. The farm includes Catherine de Medici’s stables, and the floral workshop, which creates daily floral arrangements for each room of the castle. The Orangery is an on-site restaurant, housed in an 1800’s conservatory that was originally built by the Countess of Villeneuve to grow orange and lemon trees during the winter months. Le Point Chaud, a lunch spot, is located in the castle’s former stables, while wine is sold in the castle’s 16th century cellars. History: The site of Château de Chenonceau was originally home to a medieval era castle, of which only the keep remains today. The castle as visitors now see it was built in the early 1500’s on the foundation of an old mill, then extended across the river. Built by Thomas Bohier, construction was overseen by his wife, Katherine Briconnet, who famously hosted King Frances I at the site on several occasions. After the death of the King, the castle was seized for debts unpaid to the crown. King Henry II gifted the castle to his mistress, Diane de Poitiers, who built the arched bridge over the river, and expanded the gardens. When King Henry II passed in the mid-1500’s, his widow, Catherine de Medici, took possession of the castle, added new gardens, and hosted elaborate parties, including France’s first fireworks display to mark the ascension of her son to the throne. Catherine added many rooms to the castle and had even grander plans, which were never executed. After the death of Catherine de Medici, the castle passed to her daughter-in-law, who, at the castle in 1589, was informed of her husband’s assassination, after which point she is said to have fallen into depression and spent the rest of her days wandering the halls in mourning attire, among dark tapestries decorated with skulls. More recently, the castle was owned by Marguerite Pelouze in the mid 1800’s who completely depleted her finances restoring the building to its original grandeur. The castle was then sold to its current owner, Henri Menier, of Menier Chocolates, in 1913. The building was used as a hospital ward during World War I, and was bombed by both the Germans and the Allies in World War II. It was completely restored by the Menier family in 1951. The castle has been classified as a French Monument Historique since the mid 1800’s. Today, close to 1 million visitors tour the castle each year. Ongoing Programs and Education: Visitors may tour the site guided by brochures, or with an audio-guide. Group tours may include workshops related to the castle’s history and design.